Due to the great success at the Southern Equine Event at the Bath and West Showground in October - the Shetland Steeplechase Challenge team are making a special appearance at the Northern Equine Event at Great Yorkshire Showground in Harrogate on 29th and 30th November 2003. These fast and feisty racing ponies from the Knix Stud in Brompton on Swale, near Richmond in North Yorkshire, will be racing to raise money for the Special Care Baby Unit at the Friarage Hospital in Northallerton. 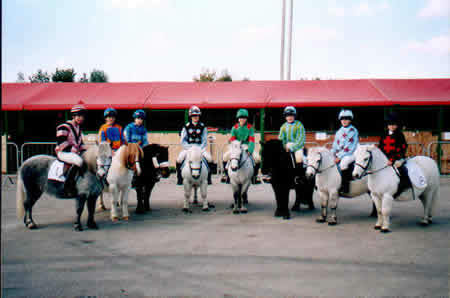 Each pony will hopefully be sponsored by friends and local business and will run under sponsors names and colours culminating in a grand cheque presentation at the Friarage Childrens ward with the help of two of the ponies and their jockeys on 13th December 2003.